Experience huge profit and repeat business with this product! Each of the above containers holds approximately 6 lbs. And, containers can be purchased separately. Above images are for showing display only. 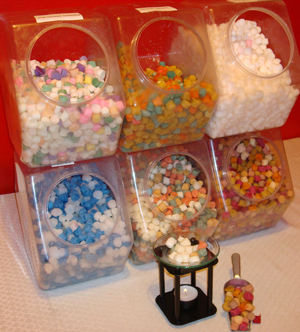 Scented ‘Mallow Melts’ are hand-made highly scented candle potpourri melts in a variety of blends and single fragrances. These are for use in potpourri warmers or simmering pots to release a constant wonderful home fragrance. Simmering pots or potpourri warmers may be electric or powered by a tea light candle placed in the bottom chamber. The look and colors are very appealing to delight the senses. And, for that reason can be used for any occasion party favors. Place a few pieces in a cello bag or tulle netting; tie with a ribbon and voila! The wax used is Soy blended. The Starter Package includes 5 lbs of highly scented candle potpourri melts; 10 oil warmers; 1 display jar for an amazing $100.00. This is an improvement and replaces our original Tart melts.